Hamas continues to verbally attack its longtime rival, accuses its members of treason for cooperating with Israel. The rift between Hamas and Fatah is reaching new heights, after a senior Hamas member on Wednesday referred to members of Fatah as traitors who must be punished. Speaking to the Palestine newspaper, Khalil al-Haya referred to the security coordination between the Palestinian Authority’s security forces and Israel as "treason". According to Al-Haya, anyone who reveals the secrets of the Palestinian forces is nothing but a "traitor to Allah and his messenger". He warned the Palestinian security forces who have been arresting Hamas members that the day will come when the Palestinian people will judge them for their "crimes" and on that day their regret of their actions will no longer help them. 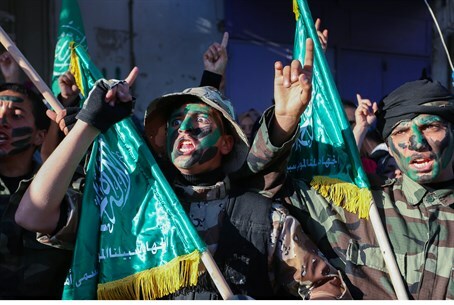 The comments are the latest in an ongoing war of words between longtime rivals Hamas and Fatah. The tensions between the sides continue despite a unity agreement signed in April 2014 which sought to end seven years of bad blood. The unity government between Hamas and Fatah collapsed in June when PA chairman Mahmoud Abbas, who heads Fatah, decided to dissolve it amid a deepening rift between the sides. Since then, the sides have continued to verbally attack one another, with Hamas making the harshest of the comments. Abdel-Rahman Shadid, a Hamas spokesman, recently accused the PA of “assisting settlers” and thus encourage “the aggression of the occupation”. The comments come one day after Hamas spokesperson Sami Abu Zuhri accused Abbas of bearing responsibility for the death of an Arab infant in the village of Duma in Samaria. Last month, PA Prime Minister Rami Hamdallah criticized Hamas for creating a shadow government in Gaza and blocking efforts to reach political unity.